That’s right. The team hadn’t so much as drawn a single game since they formed five years ago, finishing rock bottom of the table on zilch points every single season and conceding 933 goals in the process – their worst defeat being a 25-0 loss. 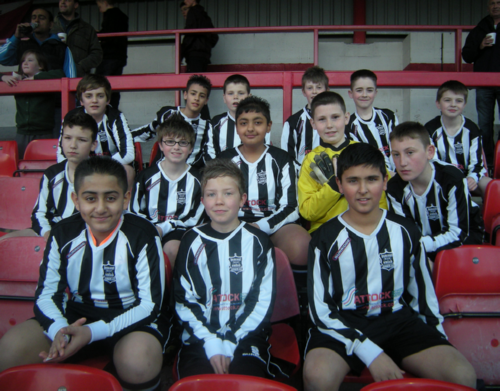 The streak was broken on Saturday afternoon when Huncoat managed a 2-0 win over Brierfield Celtic in the Accrington and District Boys League. The result didn’t lift them off the foot of the table, but they are now sitting pretty on their highest ever points tally: three. The Huncoat goalkeeper even saved a penalty to keep his first ever clean sheet! “We might be the worst team in Britain but we’re also the happiest. All the boys were jumping up and down at the final whistle. I joined in and so did the parents. Like Huncoat themselves these days, Chadwick does have a point. His side are still very much bottom of the league, having somehow managed to concede 104 goals in the space of 12 games this season! I’ve been on the receiving end of a long string of losses and remember how great it felt to finally end it. Bravo, Huncoat United. I had a similar experience whilst manager of the battersea lions u15. Play 23 lost 23, goals for 12, goals against 163. However the lads still played with smiles on their faces and that’s what grassroots football is all about!